Leave the beaten path and discover Friuli-Venezia Giulia tucked into Italy's north-eastern corner, cradled amongst the Julian Alps, the Venetian plains and the Adriatic sea. Discover the passion of Italian cycling as you ride past lush Alpine pastures and quaint towns. This region offers an epicurean delight as you feast on tantalizing cheese, San Daniele prosciutto and experience the delights of local wines from the Colio Region. Details: You will be picked up in Venice at the airport or the bus station and driven to the picturesque Il Roncal winery, nestled amongst it's vineyards. Located 1.5 hours into the foothills, our accommodation is 4 km outside of historic Cividale, founded by Julius Cesear. Staff will assemble your bike as you get settled and enjoy a glass of vino. After a short and easy ride to test the equipment we'll have dinner in Cividale at a traditional Italian/Friulan restaurant, where one of the samplings is a local cheese that will tease and amuse every taste bud. 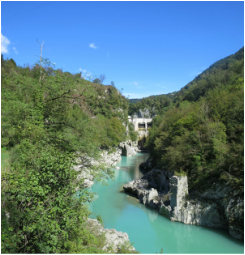 Ride Description: Today's ride will venture in to Slovenia on quiet picturesque roads that parallel the turquoise Isonzo river as we make our way to Tolmin, part of the stunning Soča Valley. Once part of communist Yugoslavia, the borders are now open and part of the European Union allowing for easy access with signs welcoming cyclists. We'll approach Tolmin on the Slovenian side, a pretty town to stop in for lunch, with the option of visiting the Tolmin Gorges or the WWI outdoor museum before returning on the Italian side of the border. Riders looking for an extra challenge can climb up Castelmonte to the Sanctuary of the Blessed Virgin, a leg burner of a climb with rewarding views at the top. ​Details: ​We will stop for lunch in Tolmin with an estimated return time of mid-to-late afternoon; although there is a good chance the ride will be extended with an espresso in one of the public town squares of Cividale before returning to the Inn. Massages, included in registration, will be available upon return before having dinner prepared of mouth watering local delicacies at our winery. Ride Description: ​We begin with a flat ride into the historical town of Gorizia, a town that has been swapped between countries several times over the centuries as borders have changed due to war. We will ride along WWI historical sites and visit wineries. We’ll have a lunch break at one of the delicious restaurants in Gorizia and enjoy a local drink, the Aperol Spritz. 63 to 140 km (elevation gain 900 to 1,900 metres). There are lots of distance options today. ​Details: Cyclists will return at different times depending on time stopped to shop, visit historical sites, or other adventures. Dinner and massage will be at the hotel. Ride Description: Today is one of two epic days this week. Riders can choose how epic they'd like their ride to be with lots of options. We'll begin with a 45 min commute to Bovec where the ride will start with a short warm-up before tackling the Mangart, a 20 km climb with breathtaking scenery. We descend the same way we went up and enjoy a flatter stretch through ski villages that will take us to the foot of the Vršič. The looming mountain views and cobbled corners are like nothing else in the world and a must for everyone's bucket list. The descent back to Bovec is parallel to the bright turquoise Soča River and WWI remnants. Every inch of this ride is beautiful. Shorter route option will be determined based on interest of group. Non-bike option: Hike the Walk of Peace through WWI historical sites. ​Details: We will re-group in Bovec for dinner before our return trip to the hotel. Ride Description: The rewards of the ups are the downs, and today we ride 60 km downhill to the Adriatic sea, through the historic and stunning UNESCO World Heritage Site towns of Palmanova and Acquileia, to the white sand beaches of Grado. Acquileia is famous for the roman ruins and mosaic floors of the basilica. Riders are encouraged to take their time exploring in this jewel of a town. ​Details: Afternoon activities include time at the beach, visiting wineries, shopping, and/or enjoying a drink on a local patio. The shorter distance group will drive back to the hotel for a massage. Dinner this evening is on your own with lots of options in Cividale. Ride Description: Prepare to challenge yourself as we head in to the Alps! The Zoncolan is a beast of climb; but in 2015, the steep grades, thunder, and rain, didn't stop any rider who attempted it! The reward of making it up this most-epic climb is the knowledge of know you can ride anything! We'll descend the same side and regroup at a coffee shop at the bottom before continuing our ride though some of the prettiest villages we've seen all week before a reward of a 30 km descent. ​Details:​ There is a 90 min commute to the start of this ride and we'll have a pizza dinner before returning to our hotel. Once back, staff will pack up bikes in preparation of tomorrow's departure. ​We will have our final goodbyes this morning at breakfast before people leave to return home or continue their journey. Transportation will be provided to Venice or Udine. Airport/train transfers to/from Venice or Udine. Bike unpacking and assembly (rentals are available for an additional charge). Luxury accommodations at Il Roncal Winery. 2 on-the-bike coaches, Petrina and Nat, and van support. All routes and itineraries are mapped out, you just show up and ride!